Added the game, Number Chain, where you need to link maths to reach the target. I've finally gotten around to adding a new maths puzzle to the site, today. Number Chain sees you filling in the operators so that the value at the top becomes the value at the bottom. Incidentally, It's been almost an entire month since I last added to Foldapuz! Added a new maths game, Combinations. Fill in the two rows without repetition. Added the new game Combinations to the fold. 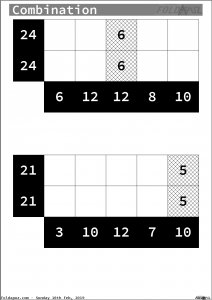 Fill in each of the two puzzles using only numbers 0 to 9, without any repetition. Each row and column has a total which you should attempt to achieve whilst filling in the grid. I'm not 100% sure how solvable these might be, so do let me know if they're insanely hard! Added a new logic puzzle, Linjat, where you need to reach from numbered cells to dotted cells, either horizontally or vertically. Added a new logic puzzle, Linjat, to the Fold. Dots show areas that must be covered, whilst the numbers suggest the length of a "line" which must be placed either horizontally or vertically. There's an online version of the game here, created by the author of the puzzle. Reworked the generator for Maths Maze, to make the solutions a little less simple. A slight tweak to the Maths Maze generator, as it was making some puzzles far far too easy. I've now added a "20 or above" limit to the goal, which should help increase the difficulty level a little, as the previous day's puzzles all seemed to be a little too simplistic. I might yet tweak it a bit further to avoid repetition, but for now it's good enough. Added a number based game, Maths Maze. Added Maths Maze. A simple roam around a maze, totalling up scores to reach the target. Although these puzzles have multiple solutions, the "proper" method should only require four moves. Aside : It's been a few weeks since a new Puzzle game popped into my head, but lying awake at 3am seems to help! Added the Logic puzzle, Futoshiki. Fill the grid with numbers 1 to 5, with the little arrows pointing from higher to smaller values. 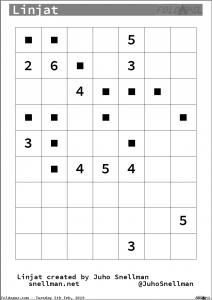 Futoshiki is another sudoku-like puzzle. Each row and column contains all numbers 1 to 5. You must use the arrows to help guide the numbers. An arrow always points between a high number and a lower one. 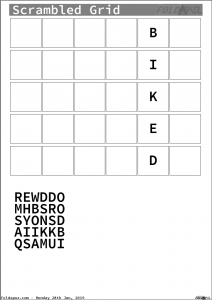 This is probably the fourth puzzle which makes use of the Wordoku premade 5x5 layouts! I might enhance this game to include 6, 7 or 8 sized layouts, but I'll need to make some larger layouts, first. Added the Maths game Kakuro, where you need to add up numbers in the grid, to make the values shown in the triangles. I started off the day by removing the single pre-drawn fence on Rebordered. Without the border, the game's now a bit harder. The one little border was making the whole puzzle a lot simpler than it should've been. Next, I added Kakuro. Each of the triangles hold a number, containing the total sum of the next few cells, either to the right or below. Your job is to fill in the digits. I'm not 100% convinced these are solvable, as I've yet to properly tackle one myself, but I'm sure I'll find out eventually. The puzzles are all over the internet, so I guess there must be some kind of logic to these, right!? If you attempt any of the Kakuro puzzles, do be sure to let me know if they work! Added the logic puzzle Rebordered (aka Fences) into the fold. Added Rebordered.. Should probably call it "fences" but the sillier name seemed to go well with the font I found. Thanks to Tom Murphy for the wonderful fonts. Reusing the puzzle layouts from Wordoku, your task is to draw borders around groups of the silly faces/objects/etc, in such a way that all 5 symbols exist within each area. Added the logic puzzle Slitherlink into the fold. Draw a single loop which crosses the grid, with the numbered grid points having that many sections crossed over. Added Slitherlink. It's a fairly standard puzzle game, but it's honestly not one I can manage to complete myself! Still, they generate well enough, and the solutions aren't always exact, so there's a bit of variety involved in the outcome. Draw one large looping line touching various points on the grid. The numbers show how many of the sides of each box are filled with part of the loop. Added the maths game MultiBox, where you need to multiply the rows and columns, correctly. Added Multi Box, a grid of numbers and their products. Simply decide which numbers don't belong in the grid and cross them out. There should be 3 numbers in each row and column, along with their product. The number of puzzles in the engine is now reaching a point where each of the categories can have it's own set of puzzles on the default sheet. 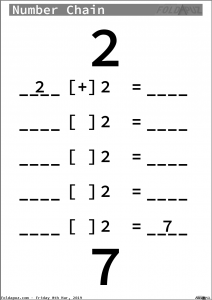 No longer does the default Maths sheet contain a few Word games, and Word sheets don't have random Logic puzzles in them. There's still the occasional inclusion of the "Extra" games (Doodle and Find a Way) but there's now 8 word puzzles, 6 maths ones and 7 logic, more than enough to completely fill each day's sheet without the need to pluck from the other categories. Added the Logic/Chess game Find the King, where you need to .. Find the King! Added Find The King, which is another little Chess based puzzle. The enemy have swarmed, and are doing really alarmingly well, and you're down to your last piece. Your King is somewhere on the board, but where can he possibly be? Incidentally, this is the game I previously had in mind, here. Added the maths puzzle Bracket Surgery, where only BODMAS can help you! Added Bracket Surgery, whereby you need to add two sets of brackets into the equation so that the result is correct. This game relies on your understanding of BODMAS, so if you're not "into" your maths, it might not appear that the original equation is incorrect! Rest assured, the maths have been checked, and the equation is wrong. Added the Logic puzzle Link Janitor. 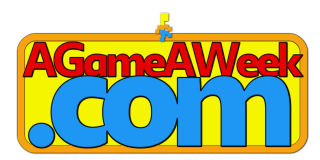 Added Link Janitor, named after my AGameAWeek game of the same name. Link up the lettered pairs without crossing paths. I've not accounted for diagonals, so avoid those. They might be do-able with diagonals, and may be easier or harder, but they're not part of the puzzle, so.. Avoid!! The previous week's cleaning up of the structure meant that everything was a little easier to work with, today, although I did forget how to use some of my own functions. Previously, I could quickly Page-Up to find a previous use of the function, but now the other puzzles are stored in separate files! Other than that, I also now have to draw a new icon for the Unfolded version, as well as update all the game-lists to account for the new puzzle. It's taking longer and longer to simply add a new game! A fair amount of icon drawing, today, as I tried my best to come up with some kind of over-arching style for the many different game icons. I'm not sure it's been that much of a success, if I'm honest, but at least I tried. I've spent a good couple of hours shuffling the script around a bit. Probably should've used includes from the start of this project, but.. Too lazy to do that kinda thing! The whole site is now split up into individual game scripts, so that the main script is a little more manageable in future. I've also neatened up the style of the Cross Target game using a bit of grey, as well as taking the time to rewrite a lot of the site's Text functions to allow for more colour and size changes in future! An awful lot of tweaking, this morning. Additionally, I refurbished the main page a bit. Need icons for Instructions and Play Online, but otherwise it's a better layout than it was. I think! Added the crossword style Word game Cross Target. Spent ages trying to find the best way to represent a Scrabble-Style board using only black ink! I should probably redo bits of it with grey, I think.. Hmm.. Anyway, it's a simple enough concept. You have a rack of tiles, and a specific target to hit. Try to score exactly that many points. A whole lot of tweaks to Unfolded, to make it all a little more stable. Just minor background things, nothing too notable, but enough to keep things working!! I've also rewritten the way the Alternating Maze is generated, and it now ends up taking about s full second to generate each puzzle. Eeek! Still, with the recent puzzle-cache functionality, that should be a little bit easier on the server. The Alternating Maze mazes should now be a little more difficult to solve, with the paths hopefully being better than just a single straight line going down the page!